Become an American Red Cross Volunteer! Important dates for residency verification, schedule pick-up and incoming Freshman events - 2019-2020.
to report a student absence. Complete absence reporting information can be found in the Wilcox Student/Parent Handbook. All visitors must register at the office and obtain a pass before coming on campus. This includes parents and former students. Thank you for helping us make school safety a priority. For more information please review our campus visitor policy. 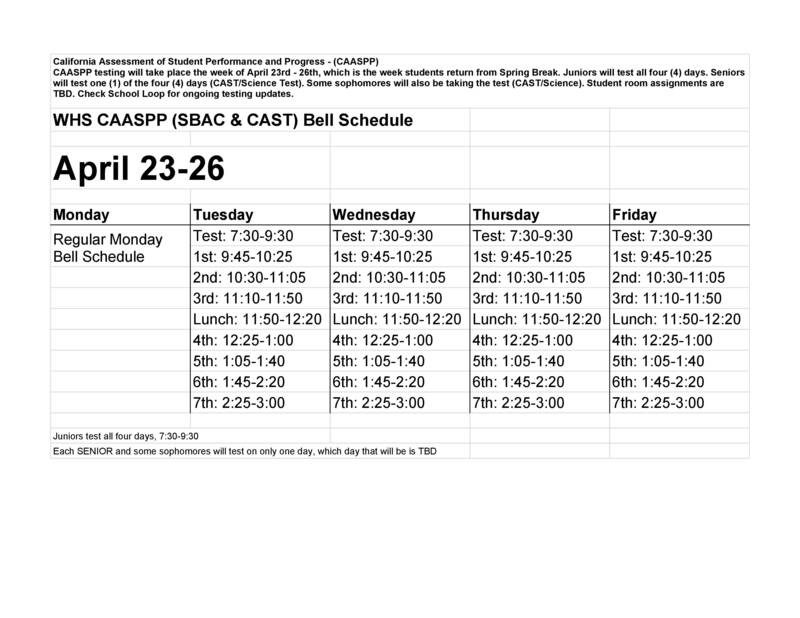 We will have a different bell schedule the week we return from Spring Break. Wilcox High School was founded in 1961 and is one of two comprehensive high schools in Santa Clara Unified School District. Current enrollment is approximately 1966 students representing a diverse population. We educate students from Santa Clara, Sunnyvale, Alviso and San Jose. Our school colors are black/gold and our mascot is the Charger. The purpose of Wilcox High School is to educate, empower, and enable all students to become caring, contributing citizens who can succeed in an ever-changing world. Wilcox High School is committed to focusing on high expectations and individual academic success and to creating a community of respect and responsibility. Wilcox High School will be a nurturing, safe and professional environment that supports the educational success and social, emotional, and physical development of all students. Courses will be academic, engaging, and standards-based, with a focus on the learner. All school staff will be highly qualified and caring instructors who are attentive to the educational, cultural and physical needs of students and the Wilcox community. Parents will be positive, supporting members of the school community. Students will be respectful, self-disciplined, productive citizens who think critically, make informed decisions and act ethically.